Editorial: Plan a "gift to lenders who abandoned any sense of prudence"
(CNN) -- John McCain is facing a fresh round of anger from members of his own party deeply opposed to the Arizona senator's proposal for the federal government to purchase troubled mortgage loans. 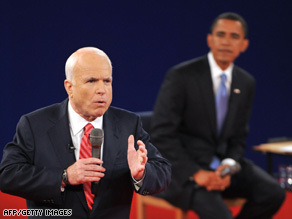 John McCain first mentioned his mortgage relief plan during Tuesday's town-hall debate with Barack Obama. The pointed backlash from several economic conservatives -- many of whom already distrust McCain's commitment to free-market principles -- couldn't come at a worse time for the Republican presidential nominee less than four weeks before Election Day as he stares at a significant deficit in national and state polls. But at a time when McCain can't afford to worry about a lack of support from his party's base, several conservatives are openly criticizing the plan as a flagrant reward for reckless behavior among lenders. Prominent conservative blogger Michelle Malkin went one step further, calling the plan "rotten" and declaring on her blog, "We're Screwed '08." Matt Lewis, a contributing writer for the conservative Web site Townhall.com, told CNN the plan only further riles conservatives upset with McCain's backing of the massive government bailout plan passed last week. "Fundamentally, the problem is John McCain accepts a lot of liberal notions, unfortunately. There is somewhat of a populist streak," he said. "Most conservatives really did not like the bailout to begin with, and this was really kind of picking at the scab." It's not just the plan conservatives are unhappy with, but how it was first unveiled as well -- out of the blue at Tuesday's town-hall debate during which Republicans were instead hoping McCain would present a spirited attack on what they view as Obama's overly liberal positions. "Here we are watching the debate hoping this is a good format for John McCain to excel at, and the first thing he does is spring this on us," Lewis said. "This is not a good way to win friends and influence people." "He spent the entire debate assailing massive government spending -- while his featured proposal of the right was to heap on more massive government spending to pursue home ownership retention at all costs," Malkin said. It's a proposal that is fundamentally at odds with the conservative principle of individual responsibility, and is the latest in a string of public spats conservatives have had over the years and in this election with their party's standard bearer. But for McCain, the move is another gamble for a candidate in need of a game-changer and one that lends credence to the self-proclaimed maverick's repeated claim that he's unafraid of bucking his own party. Under the plan, the government would buy up bad mortgage loans, converting them into low-interest, FHA-insured loans. To qualify, homeowners would have to be delinquent in their payments or be likely to fall behind in the near future. They also would have to live in the home in question -- no investment properties would be eligible. They would need to have demonstrated their creditworthiness when they purchased the property by making a substantial down payment and by providing documentation of their income and other assets. McCain economic adviser Douglas Holtz-Eakin said on a conference call Wednesday that the McCain plan could start quickly because the authority was granted by last week's passage of the $700 billion economic bailout bill. The plan could also fall under the umbrella of the Hope for Homeowners program authorized by the housing rescue bill passed in July and the government takeover of mortgage giants Fannie Mae and Freddie Mac. "The original plan relied on lenders taking the hit," Holtz-Eakin said on the conference call. "This bypasses that step." Instead, the estimated $300 billion tab essentially gets transferred to taxpayers, among the funding already provided by the bailout bill -- a proposal that may rile not only fiscal conservatives, but also struggling homeowners who have worked to keep up their mortgage payments. "The guy who works two jobs and struggles to actually pay his mortgage is penalized. He would be better off under this plan to just quit paying his mortgage," Lewis said. "And this fundamentally goes against a lot of conservative principles and individual responsibility." Barack Obama is counting on McCain's proposal not playing well with a broad swath of middle-class voters. Obama said at a rally Thursday morning it guarantees "the taxpayers would lose," and banks and lenders would be rewarded. But McCain is hoping the plan will resonate with moderate and undecided voters, many of whom viewed the bailout as a giveaway to Wall Street CEOs. This plan, the McCain campaign argues, better steers the money to Main Street, where struggling homeowners need immediate relief. "John McCain's plan represents absolutely no new expense to the taxpayer, but simply refocuses priorities to more directly assist the homeowners who are hurting instead of greed on Wall Street," said Tucker Bounds, a spokesman for the McCain campaign. But it remains to be seen if the Arizona senator's latest roll of the dice will pay off. "Liberals who might actually be inclined to support a welfare check such as this are already going to vote for Barack Obama, and conservatives, who view this as irresponsible and even apostasy, are turned off by it," Lewis said. "This is both bad policy and bad politics."